How many women…? Final 2014 statistics! 2014 is history, and so is my year-long project to track the genders of all the people I played with. Overall, 26% of my opponents in 2014 were women. 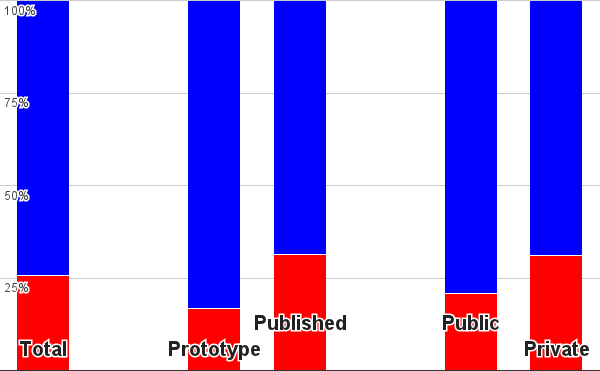 If I was playtesting an unpublished game, then 17% of my opponents were women. If I was playing a published game, then 31% of my opponents were women. If I was in a public space (like a game store or a public convention), then 21% of my opponents were women. If I was in a private space (like someone’s house), then 31% of my opponents were women. I hope no one sees these numbers as authoritative. They only show my personal experience. If anyone else takes up this project, I’m sure their numbers will differ, and they may differ by a lot! But this project has opened my eyes to the invisible ropes that I feel keep some women from participating in the hobby. I think, in a perfect world, board games could be split more evenly across genders. It’s also made me think about privilege and status. In order to play and design board games as a hobby, a person needs lots of time off to play games, to design games, to go to conventions, to playtest, to talk on the internet, to network. That person will also need a strong, steady income to afford new games, supplies, and conventions. Finally, if that person has a family, they will need some sort of support in covering family roles while they play and design their games. In order to have that sort of time and income, that person is going to need a whole lot of privilege. It means a good job with good benefits and lots of time off. It also means passing off familial obligations to loved ones. It’s something that men are more likely to be able to do than women. I believe that sort of privilege is the primary reason why there are so many more men than women in our hobby, and especially why there are so many more men who design board games than women. I know that’s a pretty big generalization, and there are going to be tons of people who are exceptions. My hope is that we start seeing more and more exceptions as our hobby develops, and we get closer to an even gender split. Finally, this project has also opened my eyes to people who identify as nonbinary; that is, people who do not identify as traditional “male” or “female” genders. This is still quite a taboo subject, and there are even more ropes and walls blocking me from tracking that as well. Many nonbinary people don’t publicly share their stance out of fear, and I felt uncomfortable asking friends who were just over to play games. So once again, please forgive the lack of nonbinary data here. Perhaps one day, someone can handle this kind of information much more thoroughly than I have. I know I’ve been hammering on gender topics on this blog lately. If you’ve found it tiresome, I understand; but I urge you to consider that there are plenty of people who don’t get to ignore things like exclusion and discrimination, because it gets rubbed in their face every single day. The lone woman in an otherwise all-male gaming group. The woman working at the game store who has to deal with customers either hitting on her or ignoring her. The woman who feels pressured to make a move in her game, before the other players start peppering her with unsolicited advice. The woman who has the nagging feeling that she should be doing something more “productive” while she’s playing a game. I’ve learned so much during this project, and I’m really grateful that I see more people sharing their views. I feel weird bringing it all up, because I’m not a woman, and I don’t want to say anything untruthful, inaccurate, or hurtful. I hope I’ve succeeded there, and I hope you will grant me the privilege to keep writing the occasional post on this topic from time to time if I find something worth discussing. With all that said, I resolve to talk more about game design in 2015!